Land Twisters is a real estate consulting company serving all over the North India. It's our efficient and effective solution that has given us domestic and global giants as satisfied clients. Land Twisters has earned a strong reputation in the real estate industry as we strongly work for the satisfaction of our customers. We have catered to numerous national and international clients belonging to various business domains. As a real estate company we have been redefining the standards of real estate and with our years of experience, we offer a wide range of services to fulfill our client's need. We make it our business to understand your financial requirements. We have already served the premier corporate houses in both domestic and international arena. We have more than 19 years of collective experience in various industries. Our expertise is to make your money work for you and manage your investment portfolio .Our motto is customer satisfaction at any cost. Address: Shivalik gate no. 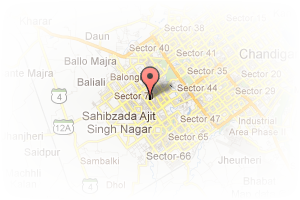 9, sector 127, Kharar Road, Mohali, Chandigarh, India. 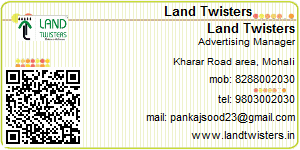 This Broker Profile page for "Land Twisters" has been created by PropertyWala.com. "Land Twisters" is not endorsed by or affiliated with PropertyWala.com. For questions regarding Broker Profiles on PropertyWala.com please contact us.